This wonderful five night/six day self-guided walk introduces you to some spectacular mountains in the world and some of the finest walking in Europe. “The Dolomites National Park protects a series of highly distinctive mountain landscapes that are of exceptional natural beauty, extraordinary in a global context, and amongst the most beautiful in the world……..” UNESCO World Heritage Listing, June 2009. This five night/six day self-guided walk introduces you to some ot the most spectacular mountains in the world and some of the finest walking in Europe. 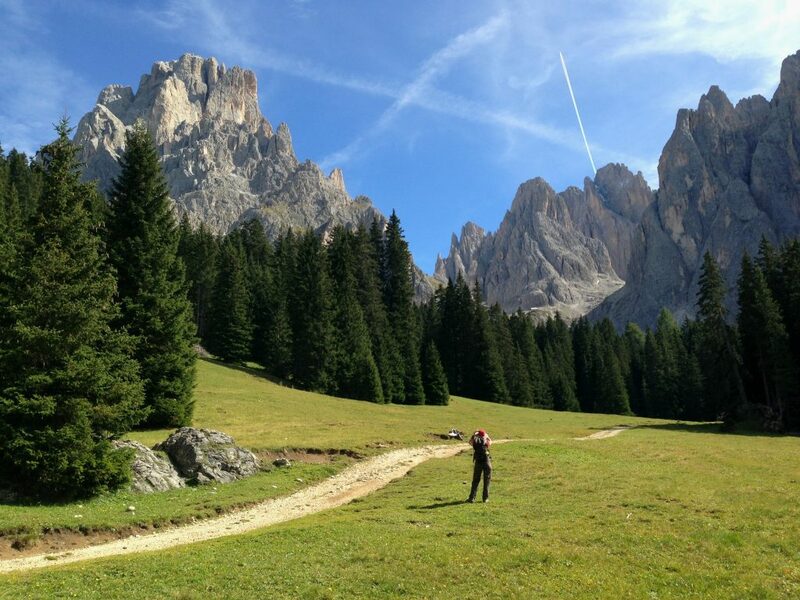 Celebrated as a skiing destination, the Dolomites also offer unrivalled walking in the summer. You will use cable cars to get to the start of each walk and then follow well-marked trails as they wind your way back to your base, stopping at one of the well-appointed mountains hut for a break and/or lunch along the way. At the start of the walk, you’ll be met in charming Bolzano, the capital of the South Tyrol and an important stop on the main Verona/Innsbruck train line, and driven to a spectacular valley an hour away. This valley is one of the prettiest in the ‘Ladino’ heartland of the Dolomite mountains and you will be based here for the next five nights. Situated on the edge of a small village, your accommodation is in a lovely family-run 4-star hotel, surrounded by alpine meadows and soaring peaks, where you will enjoy the best of Tyrolean hosptitality. Generous breakfast and delicious alla carte dinners are included. At the end of your visit, you will be driven back to Bolzano. The five walks during the tour are straightforward, following well-marked and well-maintained paths with no dramatic climbs or descents (where necessary, you will take cable cars to the start of the high walks) and follow good tracks across alpine meadows to the valleys below, stopping at mountain huts along the way for breaks and lunch. The circuit walk on Day 5 (6 hours) has some ‘exposed’ sections so is not suitable for people who suffer from vertigo – there is an alternative walk. This a Grade 3 walk. Accommodation is in ‘superior’ rooms with en-suite bathrooms in a very well located 4-star hotel, an excellent family run hotel on the sunny side of the valley with a ‘wellness’ centre, pool and surrounded by lawns. It is on the edge of the prettiest town in the valley. Dinner is at the hotel each evening. It is alla carte and does not include drinks or wine. Generous breakfasts are included. There are regular mountain huts along the walks where you can have a break and/or lunch. Spring arrives late and autumn arrives early in the Dolomites. The lifts start in mid-June and close in late September. The best time to visit is between mid-June to the end of July and then from the beginning to the end of September. It is also possible also to go in August but it is quite warm and very busy (being peak holiday season for the Italians). You’ll be picked up in Bolzano on Day 1 and taken to the valley. You will be driven back to Bolzano in the morning of Day 6. You will also be driven to the beginning of the walks on Days 2 and 4. You will use cable cars to get to the beginning of the walks on Days 2, 4 and 5. You will be picked up in Bolzano and taken north, following the Adige Valley towards Austria, before turning left into one of the most beautiful valleys in the Dolomites (a fascinating one-hour drive away). 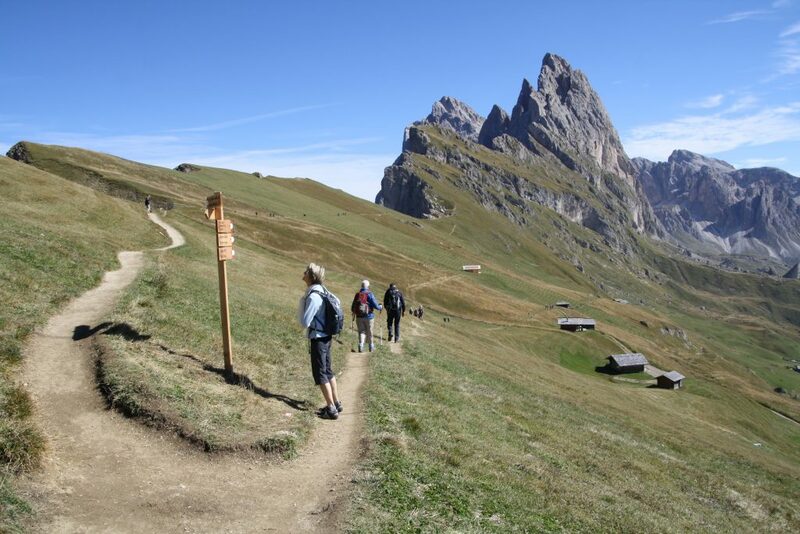 Your first walk is a spectacular introduction to the Dolomites. To get to the start, you will be driven to the western end of the valley. From here you take a cable car to the top of the northern side (to 2,500 metres) from where you have breathtaking views over the whole range, stretching to the horizon on all sides, from Austria in the north to Veneto in the south. From here you take an undulating, well-marked path across alpine pastures, through pine forests and back down to your village, with the option of stopping for lunch in a mountain hut along the way. (4 hours). This morning is an easy day, following a gentle river-side path that takes you the length of the valley past farmhouses and through villages to the largest town in the valley (1.5 hours). You’ll have time to visit the town with its shops, markets and museums and also have lunch. In the afternoon, you will have the option of walking back your base along the same trail or taking one of the regular local buses back to your base. The walk today starts with a transfer back to the eastern end of the valley and another cable car ride, this time up the southern side of the valley (to 2,000 metres) from where you walk across the largest high altitude alpine meadows in Europe, a vast undulating amphitheatre of green fields surrounded by some of the most spectacular ranges in the area. The walk passes a small hamlet where you can have lunch before continuing under the cliffs and then dropping back down through forest into the valley to your base. (4 hours). You’ll be transferred back to Bolzano, which has regular national and international rail connections.